In one more month I will have a one year old baby. It's kind of breaking my heart how fast she's growing up, but at the same time, I'm not totally crazy about the baby stage, so I'm loving her getting older and more independent. Babies are hard. The older Kennedy gets the more she becomes a friend and I can't wait to share that with Brynlie as well. • Has 3 teeth. Yes my friends, THREE! She's already 7 months ahead of her sister in that department. Kennedy only had 2 teeth until she was 18 months old. • Loves to eat. She prefers regular food over a bottle but we've been mixing formula and milk to make sure she's getting all the nutrients she needs. • Standing on her own. It's been her latest trick actually and she gets so proud of herself when she lets go and just hangs out like a big kid. • Cruising along furniture and walls. She's getting really fast at this. • She's in Kennedy's 12-18 month clothes which is seriously insane to me. Brynlie isn't a huge baby but she's a lot bigger than Kennedy was at this age. 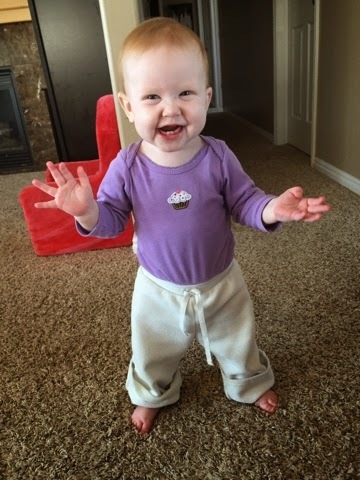 • Cute, bubbly, barely any hair, loves to laugh, protests when anything isn't the way she likes it, and keeps us laughing and on our toes every day. She's going to be fun to watch get older and start talking.